A thermoplastic coating applied to metal picnic tables or park benches is an incredibly effective way to generate more life out of commercial site furnishings. This coating is basically a plastic material that is pliable when heated above a specific temperature, but then hardens into a tough substance when cooled. One of the great features of thermoplastic is that it melts and then conforms to the shape of the object for complete coverage. It’s perfect for reaching and covering sharp edges and welded parts. This hardy material is perfect for outdoor site furnishings such as metal picnic tables or benches. The smooth coating keeps the metal from rusting or corroding and is also resistant to cracking or peeling. Since these picnic tables and park benches are exposed to the elements every day, a thermoplastic coating provides long-term, weather-proof protection. The plastic is highly resistant to harmful UV rays from the sun. Snow, ice, freezing temperatures and intense heat won’t damage the finish. The coating also resists salt spray in marine environments. While other materials, such as wood, are susceptible to mildew, fungus or insects, this is not the case with a thermoplastic coated picnic table or park bench. This hardy coating is also impact resistant. A thermoplastic coated picnic table or park bench is unlikely to ever require repairs, but if the finish is damaged or cut by vandals, repairs are easy to accomplish. In the video above, we outline the simple steps you can take to fix a thermoplastic coated picnic table or park bench. A simple heat gun can be used for repairs to thermoplastic coated metal picnic tables. Clean – wipe the damaged area clean with a dry cloth. Heat Gun – next use a heat gun or propane torch to apply heat to a damaged area. Note: be extra careful when using a propane torch. Melting Process – as the heat is applied, the plastic will begin to melt and smooth out to the original surface. The plastic around a small cut can then be easily repaired. Add Powder – for a larger area that requires repair, order a small quantity of thermoplastic powder that matches the color of the product. Repair – heat the damaged area and sprinkle the new powder onto the hot surface. Allow the powder to melt and flow into the open spots. Keep repeating if necessary to cover any barren metal areas. Let it cool and you are done. The picnic table or bench is back in business. Thermoplastic coatings can be ordered in a variety of attractive colors. And because the coating is resistant to harmful rays from the sun, the colors will remain vibrant for a long time. Maintenance can be done with just soap and water. 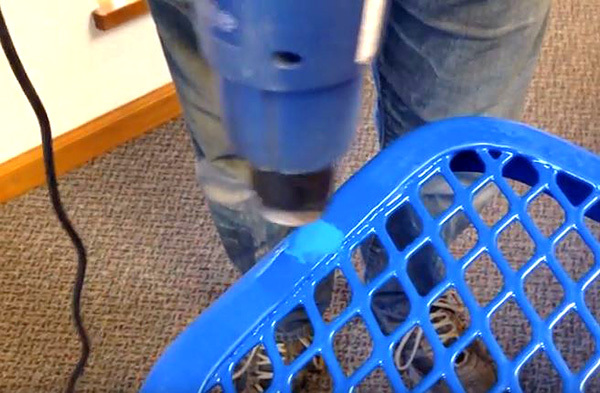 A thermoplastic coating is a tough, durable finish. But at the same time, it is easy to mend. That’s a win-win for any park or facility manager. 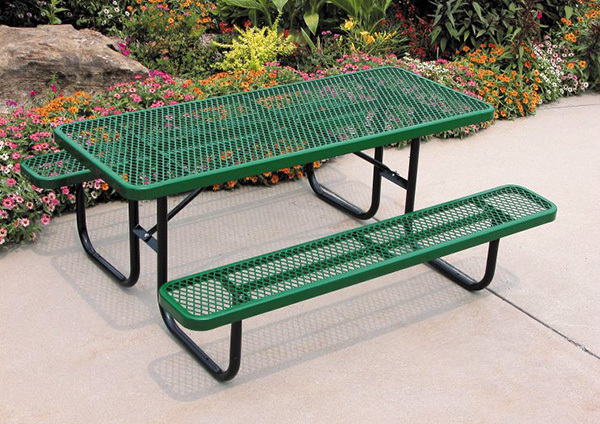 If you really want to protect your picnic tables and park benches in the outdoors, under harsh conditions, then consider the incredible benefits of thermoplastic coatings. A metal picnic table with a thermoplastic coating. This entry was posted in Commercial Site Furnishings and tagged picnic tables, park benches, metal picnic tables, thermoplastic picnic tables, metal park benches, thermoplastic park benches on February 5, 2018 by Robert Caston.